November 30, 2017 – Avon, CO: Matthias Mayer of Austria skiing the fastest time in the second training run for the Birds of Prey FIS Ski Alpine World Cup Downhill at Beaver Creek Mountain. Photo by Jonathan Selkowitz. 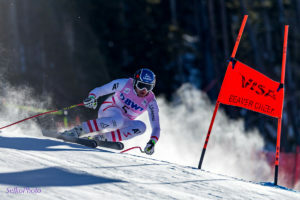 Austrian speed specialist Matthias Mayer took the top spot on Thursday in the second day of downhill training at the Birds of Prey Audi FIS World Cup race week at Beaver Creek. Mayer, who finished second in last week’s downhill in Lake Louise, finished with a time of 1:39.74 and sparked talk of the faster times to come on Saturday. Swiss racer Beat Feuz, who won the Lake Louise downhill, finished second with 1:40.40, followed by Austrian Hannes Reichelt with 1:40.56. Morse, who finished 60th on Thursday with a time of 1:43.86, was one of seven Americans who participated in training Thursday. Bryce Bennett was fastest for the U.S. with 1:41.89, while veteran Steven Nyman – still undecided about his racing program this weekend as he charts his comeback from a knee injury last January – was 39th with a time of 1:43.03. Teammate Wiley Maple, who hails from nearby Aspen, brought a locals’ perspective to the day and praised the Birds of Prey course for its challenging terrain despite the lack of snowfall. “It’s in great shape,” said Maple, who posted a time of 1:43.77. “The snow was way better today than yesterday – harder, a little bit bumpier and little faster. The track should be good for the next couple days, and it’s a lot of fun to be back in Beaver Creek. Race week continues Friday with the Super G. Racing begins at 10:45 a.m. MT.